If you buy a stock that eventually increases its dividend by 100% in the coming years, you’re going to double your money or better as that happens. 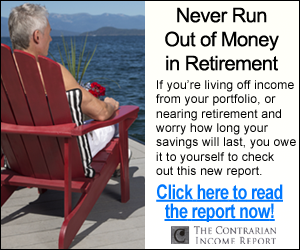 Find a payout with 200%, 300% or even 500% upside? Then we have a secure way to total returns up to 500%. When these factors combine, they can create 100% price upside with a safe dividend payers. Share prices tend to rise in tandem with runaway dividends, as investors pay more for the now-higher yield. Let’s discuss five fast growing payouts on already-cheap stocks. If I were the chief financial officer (CFO) of one of these firms, I would be salivating at how fast I’ll be able to double these share prices. All have triple-digit upside potential, and all their CFOs need to do is to continue growing their dividends and repurchase cheap shares when appropriate. Apple (AAPL) is actually the “slowest” dividend grower on this list, at a five-year compound annual rate of “just” under 11%. Everyone knows Apple for its devices – the iPhone still drives a majority of Apple’s revenues, though its iPads, Macs and Macbooks still represent significant chunks of the top line. But the evolving story in Apple is its Services division. Services – which includes things such as iTunes, the App Stores and Apple Pay – jumped 31% year-over-year to $9.2 billion in revenues for the most recent quarter, putting the company well on its way to doubling Services sales between 2017 and 2020. Yes, that’s far less than the $38 billion generated by the iPhone, but it still was enough to represent 15% of Apple’s revenues for the quarter. Just like most everything else Apple does, the Services division drives fat margins, which filters down into ample cash flow. Moreover, Apple is finally putting its $270 billion cash reserve to work thanks to a forced repatriation resulting from the Tax Cuts and Jobs Act. So while Apple is a dividend dynamo that’s growing its payout like a weed, investors also will enjoy the benefit of share buybacks. AAPL said this year it will repurchase a whopping $100 billion worth of shares, in addition to the record $23.5 billion it bought back during the March quarter. Utility stocks are no stranger to lists of dividend growers. However, they tend to fraternize with other slow-income-growth plays thanks to their longevity but inability to raise rates more than a couple percent every year. Which means AES Corporation (AES) isn’t your typical utility stock. AES, which provides power in 15 countries, started as a consulting firm in 1981 and eventually expanded to electricity generation by building plants and acquiring companies such as Indianapolis Power & Light and Dayton Power & Light. AES’ dividend has been marked by rapid expansion in its formative years. The quarterly payout began in 2012 at 4 cents per share; it stands at 13 cents today. Also noteworthy is a significantly lower forward P/E than the Utilities Select Sector SPDR (XLU), which trades at 16.5 times earnings estimates. Southwest Airlines (LUV) is a breath of fresh air in an industry that at this point is identified by being hated by its clientele. The discount airline has long put an emphasis on pleasing both its workers and its customers, with the focus on the first contributing significantly to the latter. Southwest frequently sits near or at the top of J.D. Power satisfaction surveys, including winning the low-cost category for 2018 with the highest overall score among all airlines – even “traditional” carrier winner Alaska Airlines (ALK). 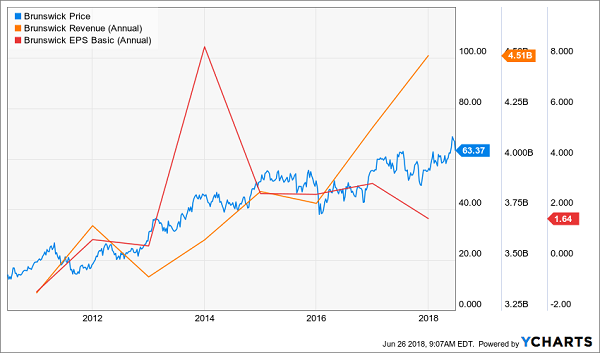 While reliable profitability growth can be a challenge for airlines thanks to factors such as oil-price swings, Southwest’s EPS have climbed – well, soared – every year since 2012. 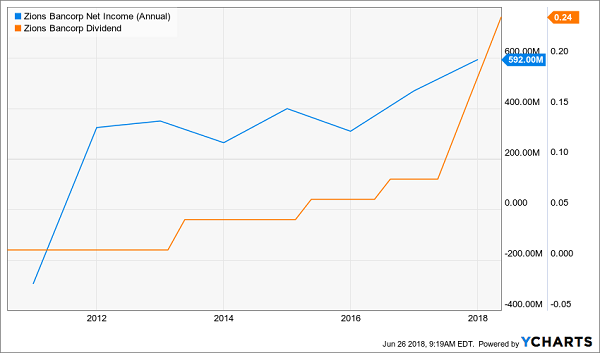 In fact, profits have exploded so much over the past five years that despite quadrupling the payout in that time, LUV sits at a laughably thin 8% dividend payout ratio right now. Expect Southwest’s dividend growth to go essentially unchecked for years on end. Brunswick Corporation (BC) isn’t a household name, but it has brought more fun to Americans than just about any company not named Disney (DIS). Brunswick is the name behind watercraft brands such as Bayliner, Flipper and Meridian Yachts; fitness products under brands such as LifeFitness and Indoor Cycling; and billiards under its namesake Brunswick brand. It also boasts a marine engine business. This company has seen quite a bit of tumult over the past few years. The company exited its bowling-center and bowling-supply businesses between 2014 and 2015, and announced in late 2017 that it would sell off its Sea Ray brand of pleasure boats. That has resulted in numerous restructuring and other charges that have injected some turbulence into the company’s profitability. That said, BC shares keep heading higher for a reason, and optimism about the company’s future should keep that momentum intact. For one, Brunswick has opted to retain the Sea Ray business, and drastically change it. The company said in June that it will discontinue its yacht models and emphasize sport boats and cruisers instead. Analysts, meanwhile, are high on Brunswick’s bottom line going forward, projecting 19% growth in adjusted profits, from $3.89 per share in 2017 to $4.64 per share this year, then 11.2% expansion to $5.16 in 2019. I’ll stress that analyst estimates are based on “adjusted” earnings because Brunswick’s profits over the past few years have involved a lot of one-time accounting shenanigans. For instance, last year’s $3.89 in non-GAAP earnings actually into just $1.64 in GAAP earnings. But that’s OK – even factoring all that in, Brunswick’s current 19-cent dividend translates into a mere 46% payout ratio on its honest-to-god profits. I don’t expect Brunswick to match its dividend quadrupler of the past five years, but I do expect it to easily outpace the market average. Zions Bancorporation (ZION) is one of a handful of U.S. “super-regional” banks that include the likes of Regions Financial (RF), KeyBank (KEY) and SunTrust (STI). 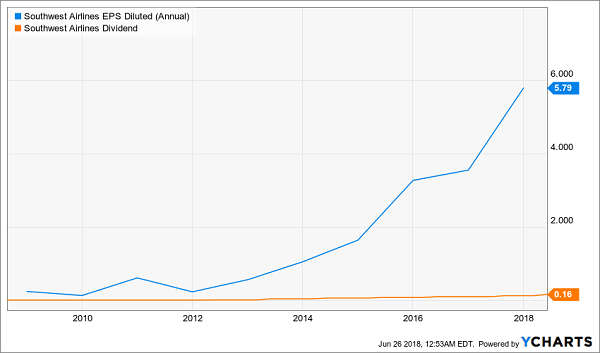 At $10.8 billion in market cap, it isn’t a mom-and-pop credit union, but it doesn’t nave the national footprint of a Bank of America (BAC), either. Zions operates in 11 western states, under various brand names, in businesses ranging from small-business lending to mortgages to checking accounts to agricultural finance. Given that Zions is only doling out about 1.3% a year in annual yield, you could be forgiven for thinking you’re better off squeezing income from a Zions Bank CD rather than its stock. I suggest a second look. Zions was forced to drop its dividend from as high as 32 cents per share in 2018 down to just a penny per share until 2013. Right before its first increase in years (to 4 cents per share), the stock was yielding roughly 0.15% on shares trading around $27. Five years later, those same shares yield 3.6% on the original cost basis – not to mention they’ve gained about 90% in value! That comes amid a burgeoning business that is enjoying a twofold boost from this burgeoning economy and the Federal Reserve’s slow but steady rate-hiking, which helps Zions and other banks generate more net interest income. To wit, Zions primarily credited its 35% annual earnings growth in 2017 to a $198 million improvement in NII. Wall Street is looking for average annual profit growth of 10% a year for the next half-decade. That, as well as a meager 35% payout ratio, should have shareholders giddy about more breakneck dividend growth going forward. The very best dividend stocks rarely show high yields because their prices keep rising in line with the increasing payments. Most people never realize this. But those of us who DO stand to profit handsomely and almost automatically! 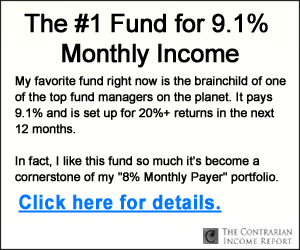 I’ve scoured thousands of stocks out there right now, looking for the very best companies that have both rising dividends and strong buyback programs in place … the kind of stocks that could easily spin off annual total returns of 12%, 17%, even 25% or more … doubling your money in very short order. Right now, at this very moment, there are 7 in particular that I think you should consider buying. They stand to do well no matter what the broad market does … regardless of what happens in Washington … and irrespective of interest rate trends. Please click here for a quick rundown on my 7 favorite “Hidden Yield” stocks – including the company names, their stock tickers and my recommended buy-up-to prices.